Paramo says:"In 1996, Páramo pioneered reversible shirts, offering a cooling face and a warming face - two shirts for the weight and price of one. Now our Cambia range takes this concept lightweight, using reversibility to create a next-to-skin range, which is more adaptable than any other technical T-shirt or base layer. Whether worn on its own or under other Páramo gear, it's unique in offering two fabric faces so you can fine-tune your comfort level simply by choosing which way out you wear your T-shirt." The wicking during exercise is very effective and it also provides warmth as the base in a layering system. The cut is very flattering and there are no clumps of excess material so you can wear it over leggings or tucked into more substantial trousers. 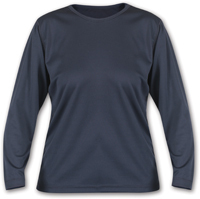 At £30 this is not cheap but if you need a really versatile garment that you can use for high-energy activities and to provide additional warmth as a base layer, then the Páramo Cambia Long Sleeved T-Shirt for Women will be a good investment.